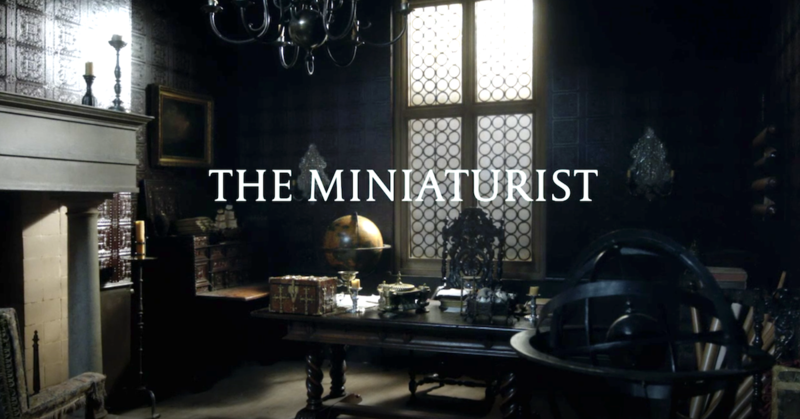 Miniatures have a strong presence in movies and television programs this year. Here are the ones that I have seen or that are upcoming. PBS is currently (September 2018) showing a 3 episode series based on the popular 2014 book by Jessie Burton. Set in 17th century Amsterdam, the story presents a young woman, Nella, who is married off to a man who has deep secrets that disturb the household she has to run. 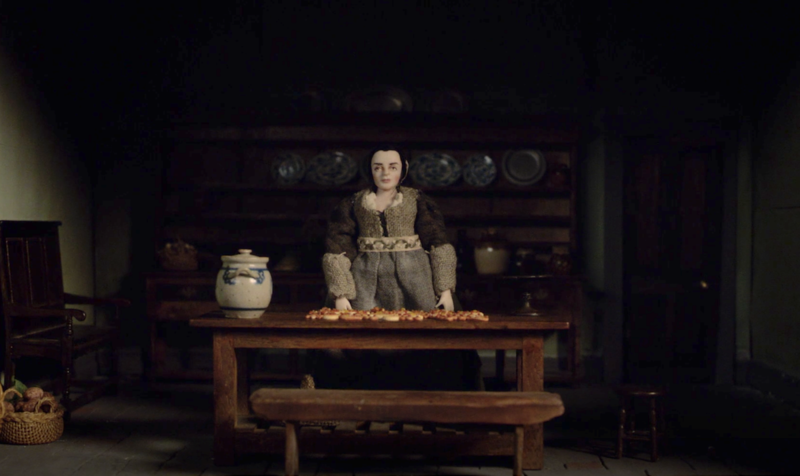 Nella is given a large dollhouse by her new husband and the miniaturist she hires to fill it starts making eerie objects and dolls. Like the book, the series, so far, does not explain how the magic of the dollhouse works. But this series does focus on the dollhouse more than the book does and visually the series is beautiful. 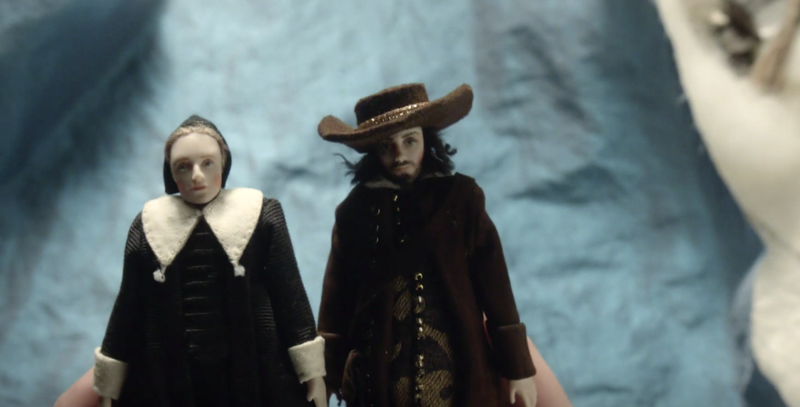 PBS has a short video explaining how the miniatures were made. 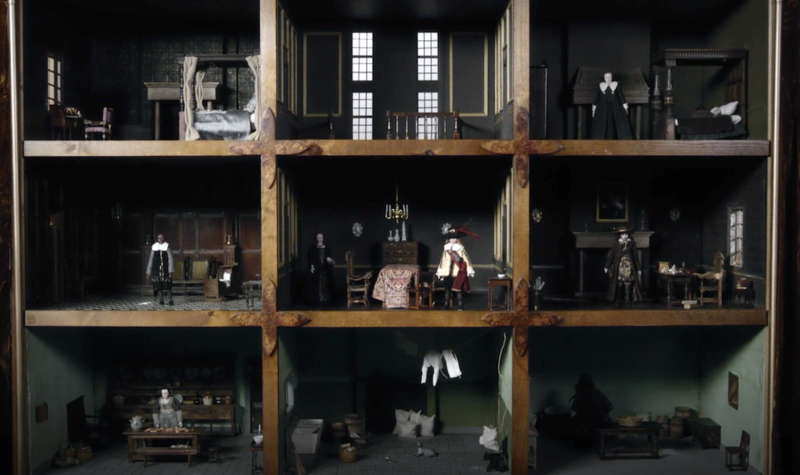 The dollhouse in the series is based on one that really exists in the Rijksmuseum which has a large collection of miniatures. I found at least 70 exquisite miniatures in their collection. One of the wonderful things about this museum is that they allow the use of images of the objects in their collection for free. Check them out (change the language to English). HBO presented an 8 episode series based on the 2006 novel by Gillian Flynn. It is the story of Camille Preaker, an alcoholic reporter who also cuts words into her body. She returns to her hometown to investigate the murder of two young girls. 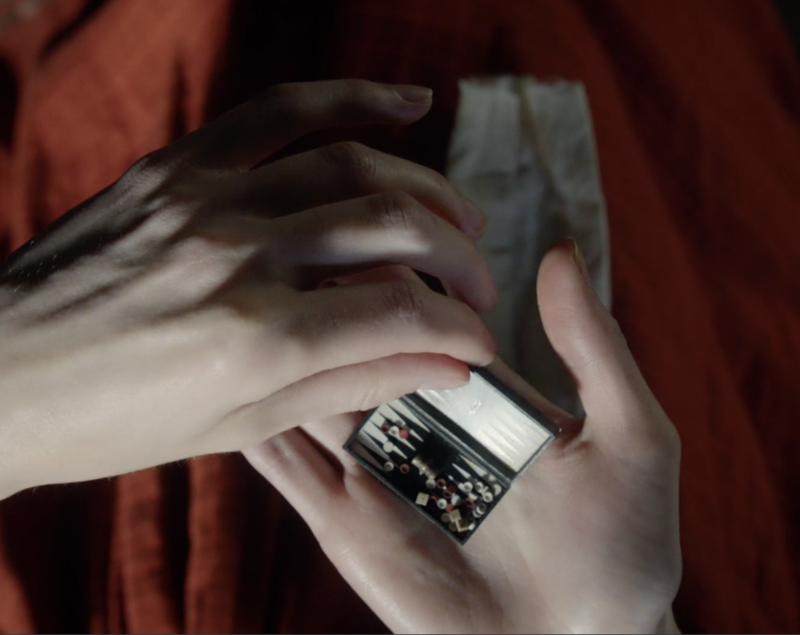 The murder mystery is paralleled by Camille’s own efforts to understand her own situation. Playing a role in the story is a pretty dollhouse owned by Camille’s step-sister, Amma. The dollhouse in the story is a replica of the house Camille’s mother, stepsister, and stepfather live in. An article on the construction of the dollhouse is available on Vulture.com and on VanityFair.com. 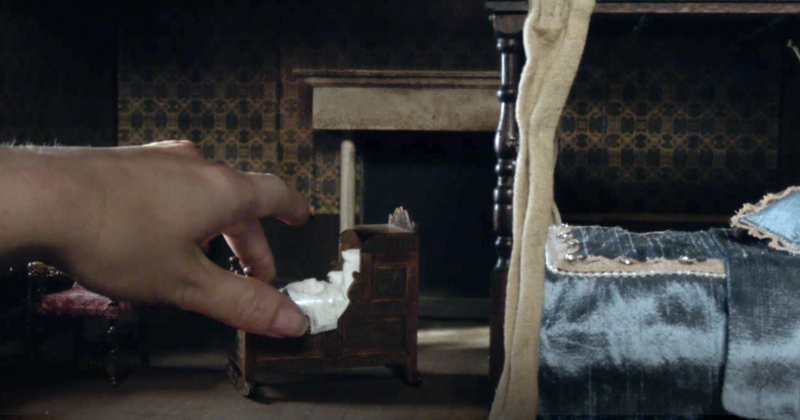 Creepy spoiler: the dollhouse, it turns out, was being decorated in part by souvenirs (teeth and hair) from the murder victims. If you are squeamish, you may want to pass on the images and details. The movie Downsizing was released in late 2017 and offered an interesting premise. With the world suffering from overpopulation and environmental degradation, scientists invent a procedure for shrinking people to live in tiny communities where their money is worth more and their lives do not rely on creating pollution. Unfortunately this interesting premise is lost in a film that is trying to go in too many different directions. The visuals, however, are interesting and the interactions between the full-sized world and the shrunken one are both awkward and funny. The movie was not successful at the box office. One of my favorite movies of the summer was Ant-Man and the Wasp, the second film in the Marvel superhero series. With good dialogue and wonderful miniature effects, it was a fun look at multiple forms of resizing the superheroes, from infinitely small to gigantic. Marwencol is the name of a miniature town and the documentary about the construction of that town by artist Mark Hogancamp. Hogancamp created the World War II doll-scaled town after he lost his memory when he was beaten outside a Kingston, NY bar. The PBS website has extensive details on the original documentary and Hogancamp’s website documents the project further, including with his photographs. A fictionalized account of the same events and people will be released in December, 2018. Titled Welcome to Marwen, the trailer shows the same miniature scenes but now recreated with digital effects as well as real miniatures. Starring Steve Carrell and directed by Robert Zemeckis, the power of miniatures to create alternative worlds is vividly displayed.